Hello Azureé Talent Family! This page was created to inform our talent and website visitors of local plays, community service opportunities and local auditions, etc. If you know of any community events please feel free to email us with all the details to azureetalentnewsletter@gmail.com. Enjoy! 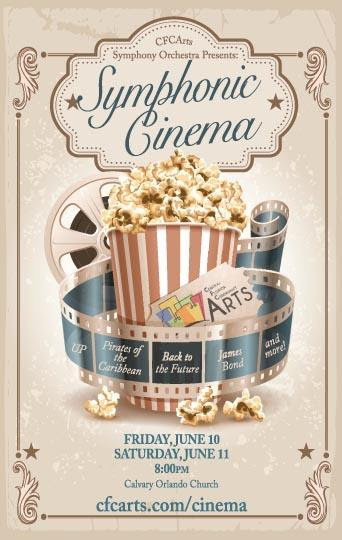 Symphonic Cinema, presented by the thrilling 150-piece CFCArts Symphony Orchestra will be held onFriday, June 10th and Saturday, June 11th at 8:00pm at Calvary Orlando. Featuring iconic music from unforgettable films such as Back to the Future, Pirates of the Caribbean, UP, Titanic, and many more, this concert event is guaranteed to be a box office hit for the whole family. Tickets can be purchased for $10 (credit card/Paypal) in advance, or can be purchased at the door for $15. All seating is general admission, and children age 12 and under will be admitted for free! Skip the ticket line at the door – click here for more information and to purchase tickets.